Well, another exciting project is (nearly) finished in our ongoing on-verge-of-becoming-a-saga-kitchen-renovation. 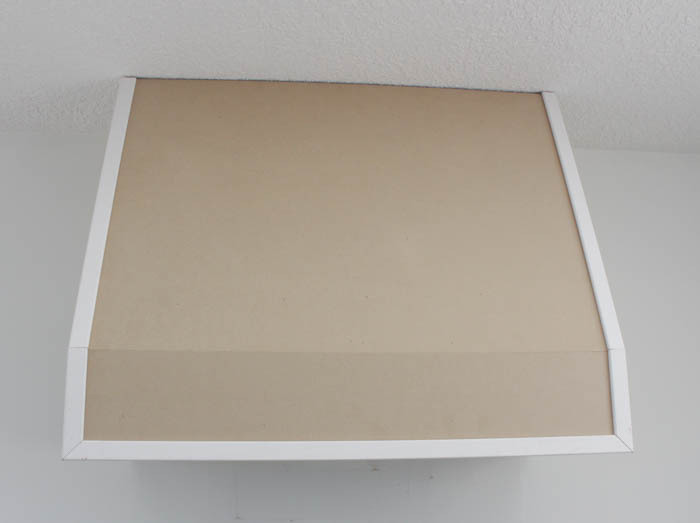 We have built and installed our DIY Range Hood Fan with our Broan Insert from build.com. I am breathing a sigh or relief after this one. It actually was a lot easier then I thought it was going to be, but we went back and forth for so long trying to make a decision about exactly what we wanted that I am glad to have finally made a decision and gotten on with it! And today I have a very long and detailed tutorial for you, in case you ever decide you want to tackle a project like this. Now that it is finished (aside from painting), I would say it was well worth the effort. 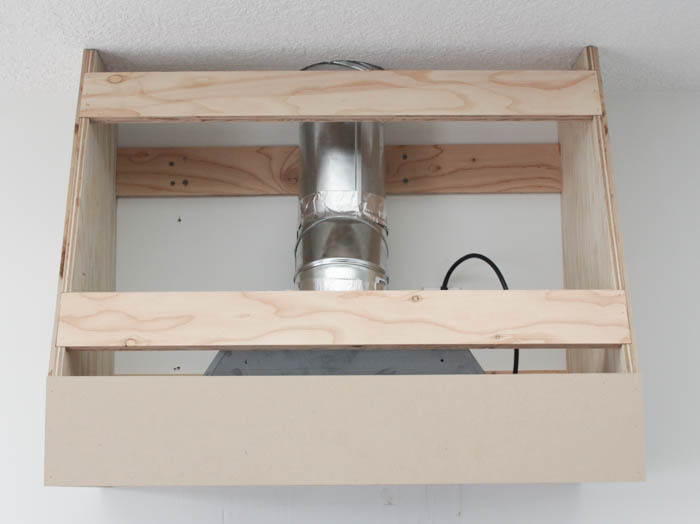 You do need access to some tools to build this wooden hood fan. 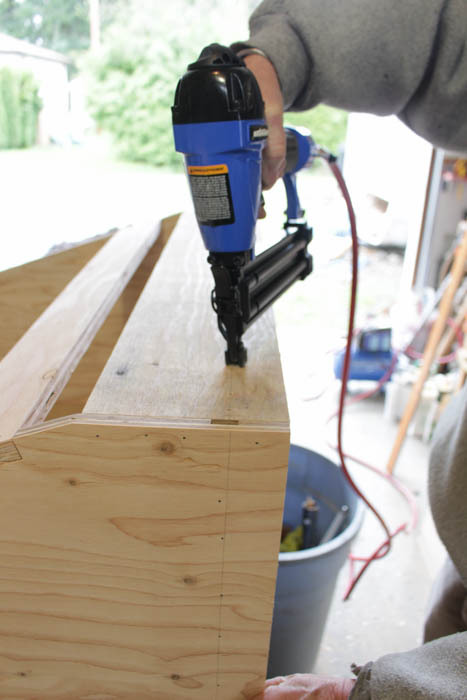 We used a table saw, a nail gun, and a drill. 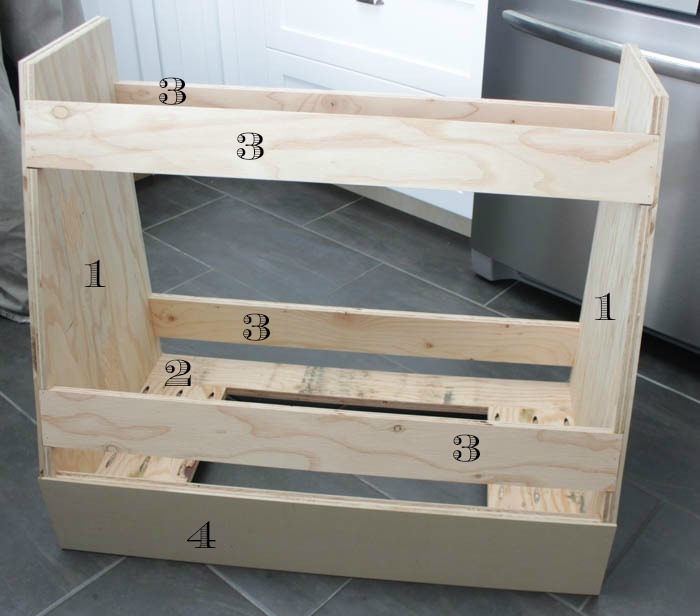 The materials were 3/4″ plywood, some 1/2″ plywood, 1/4″ MDF, and MDF corner molding and flat molding for finishing it off. 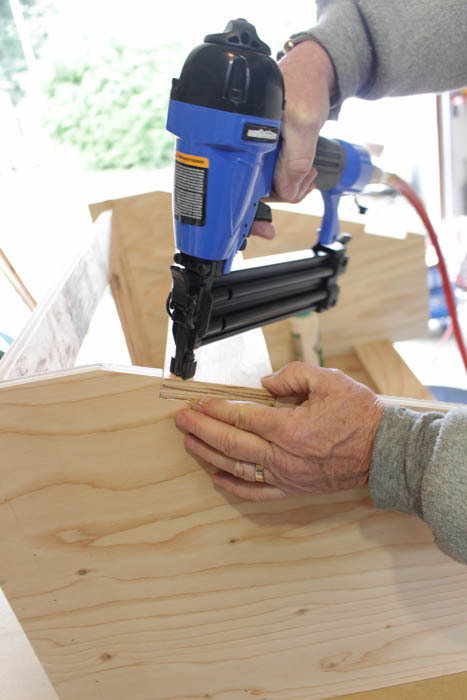 We also used wood glue, clamps, and a straight edge and pencil for marking where to nail during assembly…. 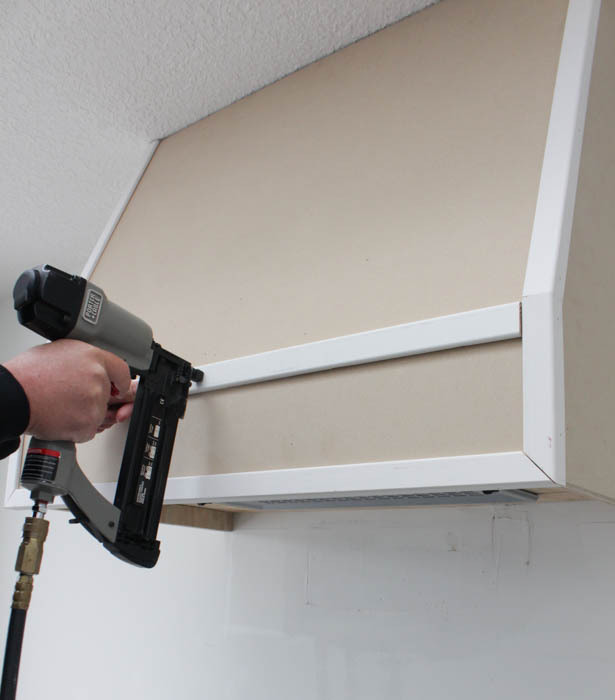 Of course the most important part of this DIY was the Broan PM390 Custom Range Hood Insert that we ordered from build.com. This unit has many awesome features as well as the option to be recirculating, but we had some new ducting installed so that we could vent ours outside. Okay, I want to make this as simple to understand as possible. Keep in mind that I am only a “learning” woodworker/builder. I had a great deal of help in executing this project – my Dad was really the brains behind the operation. He is a master woodworker and has built entire kitchens from scratch before. But I did work along with him for the process and I learned a ton! I’m hoping that by sharing this project, I can help other more ‘beginning’ woodworkers get a good grasp on how to complete a project like this. 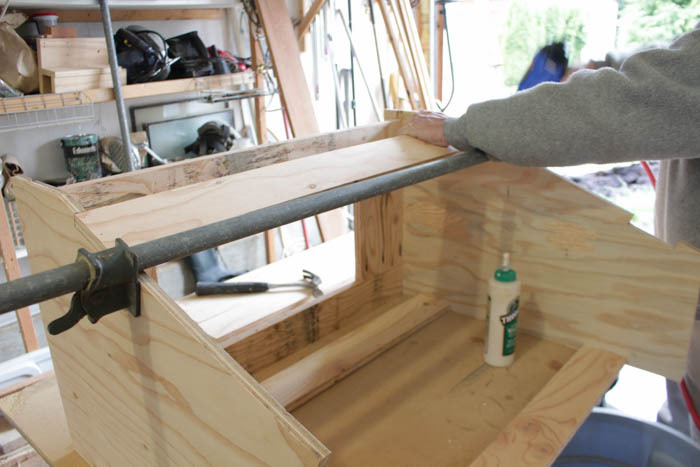 The basic idea was that we built a frame to house the Broan hood fan insert out of (mainly) 3/4″ plywood. 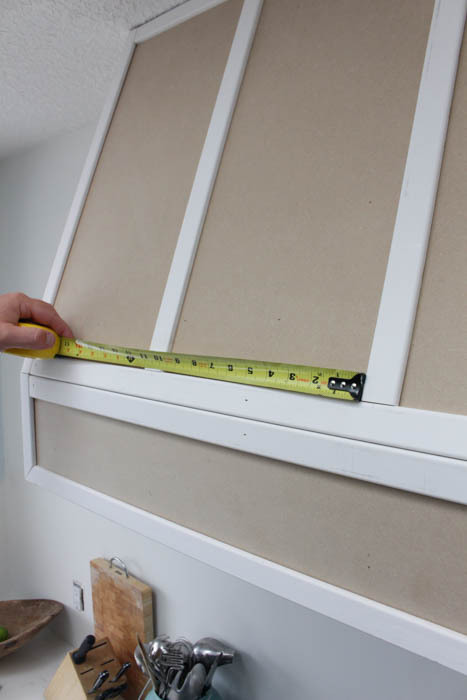 We then hung the frame on the wall, installed the Broan insert, and faced the frame with 1/4″ MDF and then molding. The last step will be painting, but I have something special planned for that and will share that in another post. 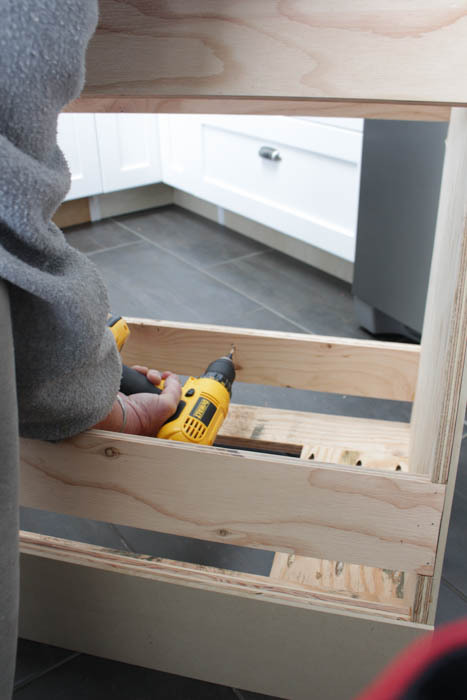 Just so you can get a visual of what we were working towards as I show you the tutorial pictures, this is how the frame looked when we were finished construction it… For simplicity sake, I am going to number the pieces and explain them to you: 1 – are the side pieces. 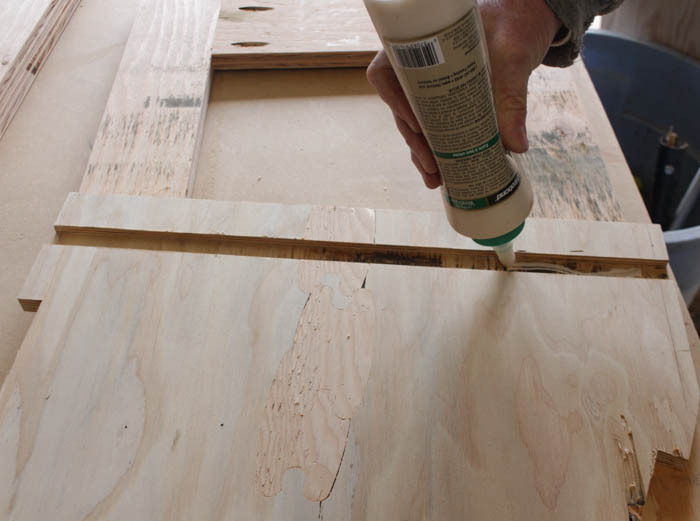 We cut two of these out of 1/2″ plywood. 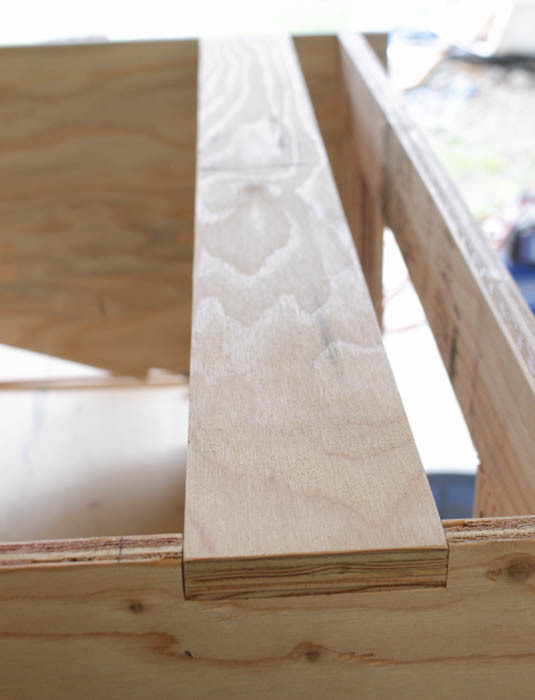 You could also use 3/4″ plywood which is what we used for the rest of the frame, and adjust your measurements accordingly. 2 – is the base piece. 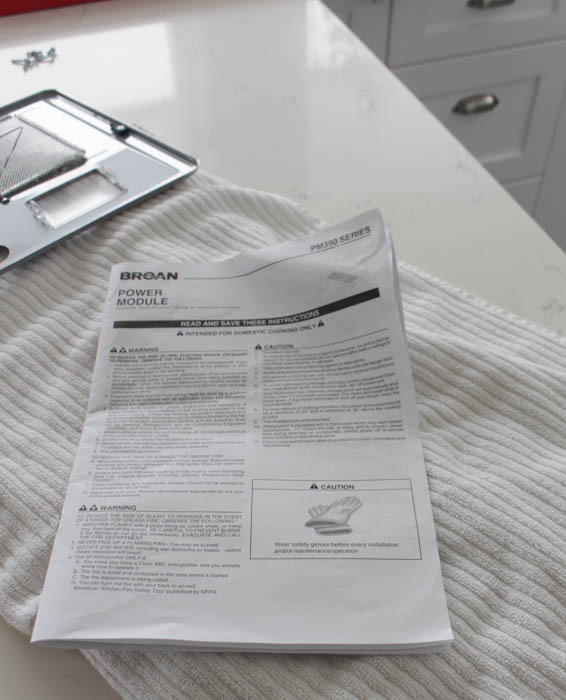 This is the piece that houses the actual Broan insert (see the cut out portion in the center – we cut that out according to the sizes indicated in the instructions that came with our hood fan insert. 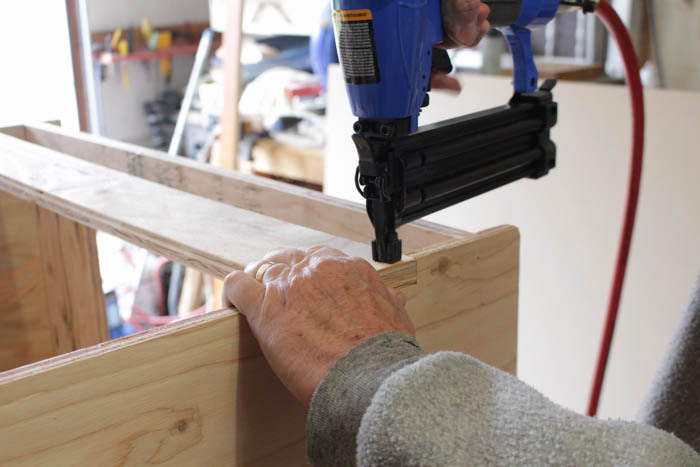 Read the instructions and safety warnings on your insert FIRST. 3 – these pieces I called the framing pieces. 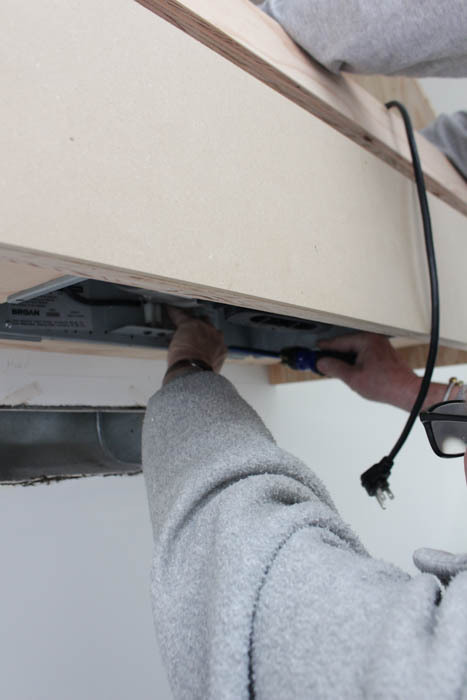 We used them for structure and support – the back ones were used to hang the finished frame on the wall. 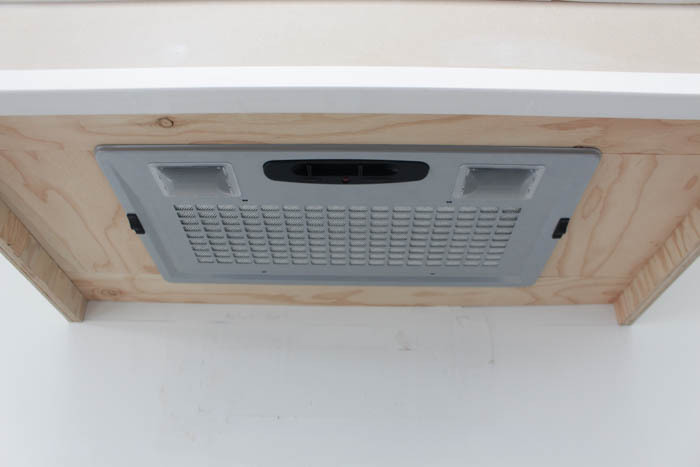 The front ones were used to attach the MDF facing piece to once the frame was attached to the wall and the hood fan was installed. 4 – this piece I called the “face piece”. It is a straight 6″ tall piece, after which the hood fan slants up and back at an angle. 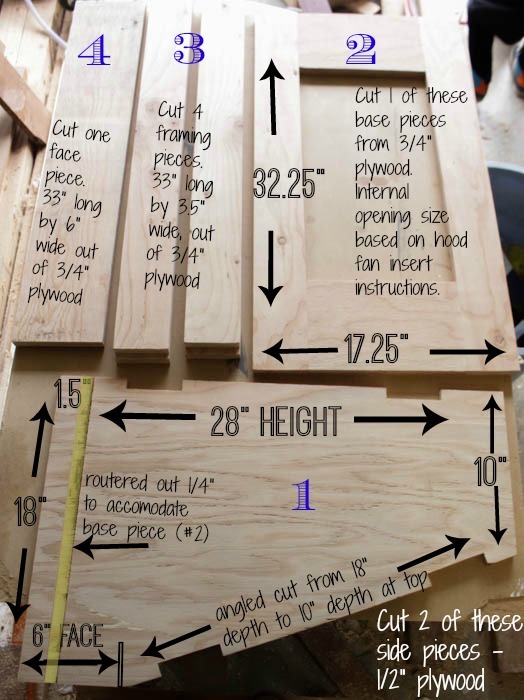 I labelled the finished fan here: Okay, here is how we cut the wood for the frame: If that doesn’t make sense and you are confused, comment on this post or shoot me an email at krista@thehappyhousie.com and I will try to answer any questions you have. 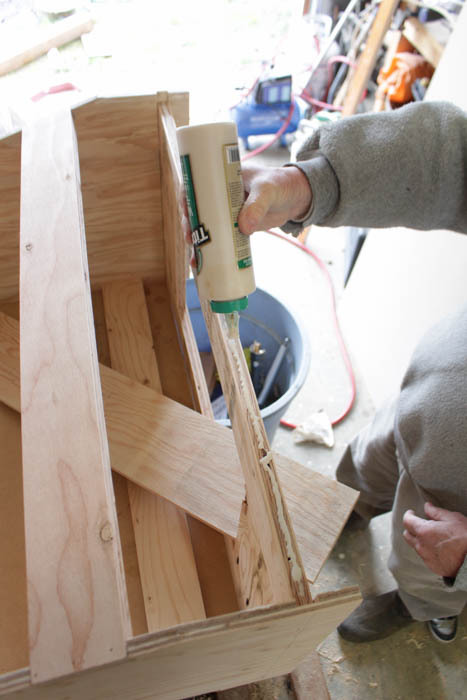 We used a large clamp to hold it in place while we glued and nailed… making sure to keep things flush before nailing. After the 4 frame pieces were attached, it was time to attach the 6″ wide face piece. 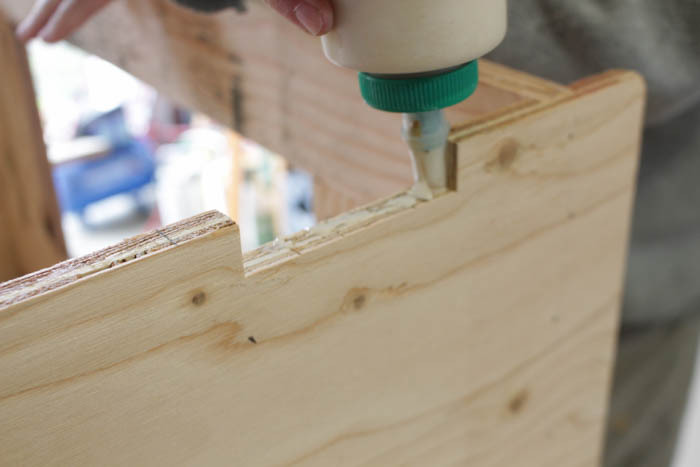 You can see here that we continued to mark with a pencil where we should nail so as to make sure that we didn’t miss the plywood we were nailing into… And the frame is complete! 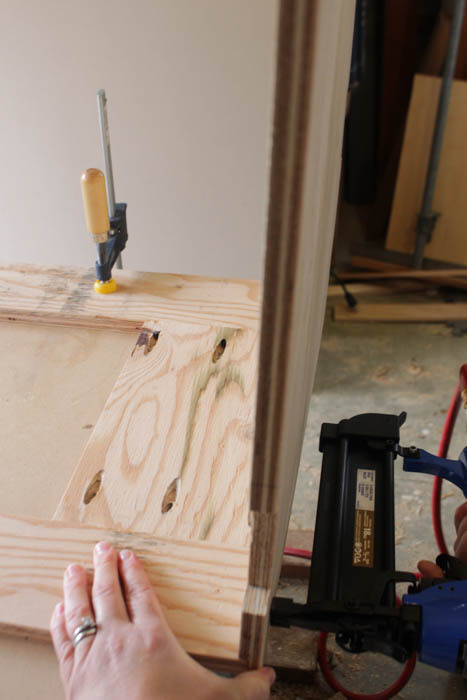 Next we cut pieces out of 1/4″ MDF to face the exterior of the frame and give it a smooth finish to paint on… We traced the sides of the hood fan cabinet onto the MDF and then cut them out on the table saw. 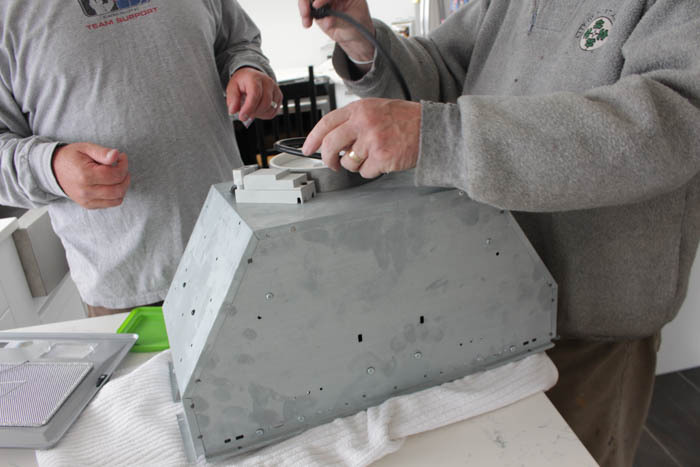 We also measured and cut pieces for the 6″ face and then the angled face up the front of the unit. 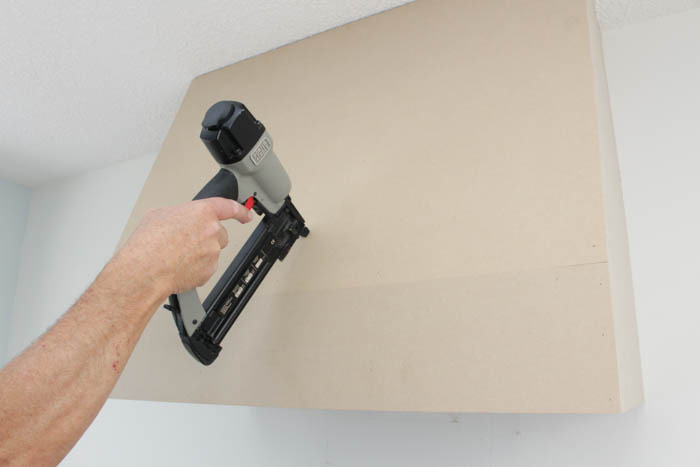 We attached the MDF to the sides and the 6″ face piece right away using the nail gun, but obviously had to wait to attach the face piece of MDF until after we had hung the frame on the wall and installed the Broan insert. We just need paint! We also plan to add some more molding along the sides (after the tiling has been completed up to the sides of the fan) as well as add some beautiful corbels underneath it. But it is pretty exciting have a functioning fan after being without one since last August! 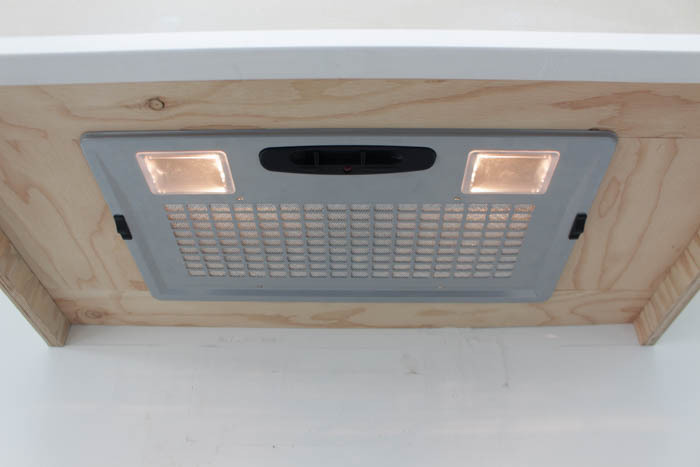 Here is how the Broan insert looks from underneath (we will be painting the plywood that buts up to it as well)… And it even has some great little lights! So, I must say, it is pretty exciting to have another functional piece of our kitchen done. Next up: tile. Then finishing off the corbels/molding/paint for the hood fan. Painting the window trim. 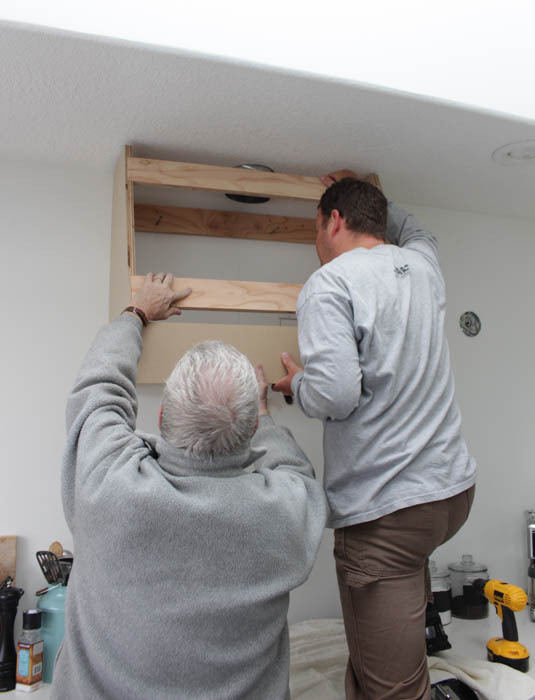 Installing the light fixtures. 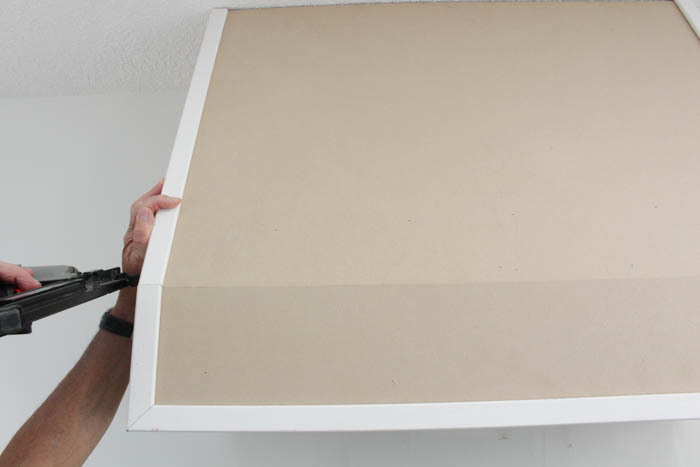 Paneling the ceiling (I still have my fingers crossed on that one). Planking the peninsula. Installing toekick and crown molding on the cabinets. 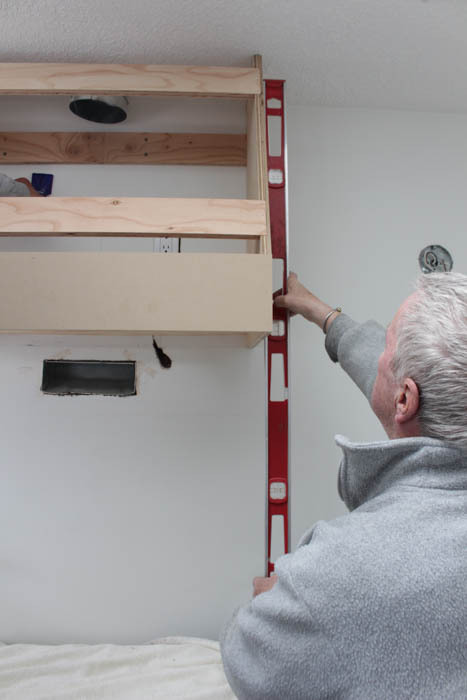 And adding some open shelving. Almost there?! AHHH!! Sounds like a long list… Wish me luck. I think I need a coffee… or maybe I should switch to Matcha. This could take a while. We are getting the same hood insert (Broan PM390)! I have a couple of questions for you before we make the big leap (and follow your excellent tutorial!). Do you have any issues with keeping it clean without the 30″ liner? Also, did you wire or plug yours in? On Build.com someone in the Q&A said that this was a plug-in unit. We have an outlet on the wall right where it will live already. I doubt it would be an issue either way, just want to know if we need to call up an electrician to wire it or if we are fine as-is! We will need to modify the base plans a little as it is going between two cabinets and we have a 30″ space to play with. Thank you for an excellent tutorial! I love how yours turned out! 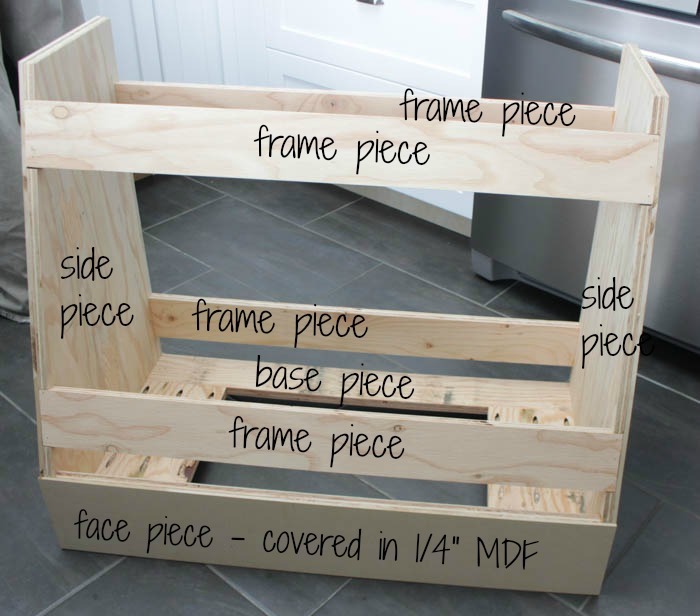 Hi Jess, we are about to renovate the kitchen at our new house and I think we will build this again! It wasn’t an issue to keep it clean. And we either hard-wired it right behind the unit, or we maybe had a plug installed there to wire it to. I’m having a hard time remembering that detail right now… sorry!! 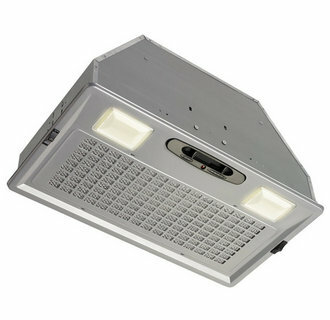 Just search kitchen on my blog (in the search bar on the homepage) and you will see tons of examples of the completed hood fan. But thanks for the reminder – I need to add some completed pictures to this post! Wow, this is an impressive tutorial. 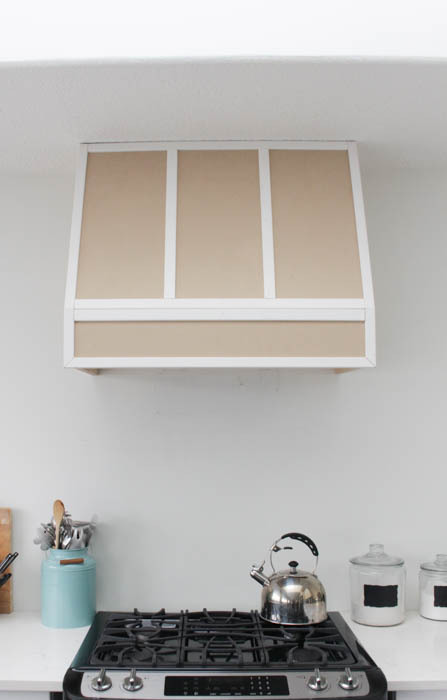 It never crossed my mind to create a range hood using wood but it turned out great! Looking forward to seeing your 2018 projects! Looks GREAT!! These instructions will be a helpful tutorial as I attempt to tackle the same. Although I only have 30 inches between my cabinets so will need to adjust measurements. Is your range larger than 30″?? Love the project, we are getting ready to do the very same thing. The one thing that I am concerned about however is moisture under the hood. Have you had any issues with moisture or cleaning the wood surface under the hood surrounding the hood insert? What happen if you nee to troubleshoot or replace the unit, ho will you have access to it? 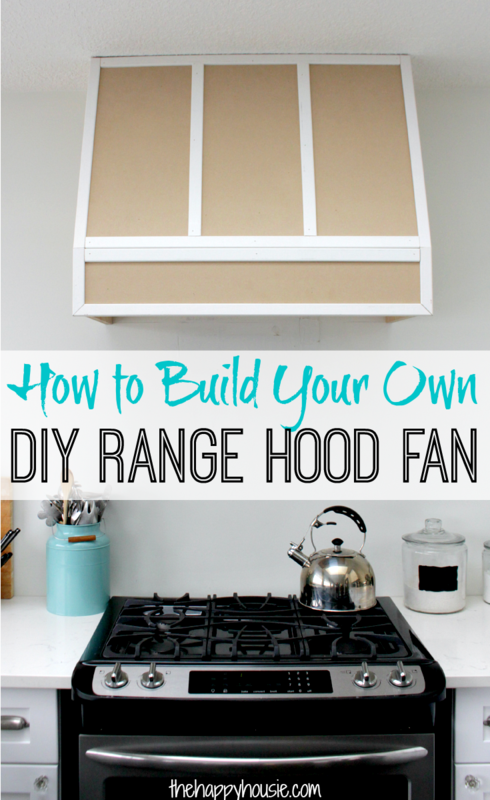 I was wondering what you thought about building the entire hood out of mdf? Is that advisable? Hello Damaris! Yes, we did talk about that, but MDF is not a structurally sound as plywood and is more subject to moisture issues (by the steam etc. 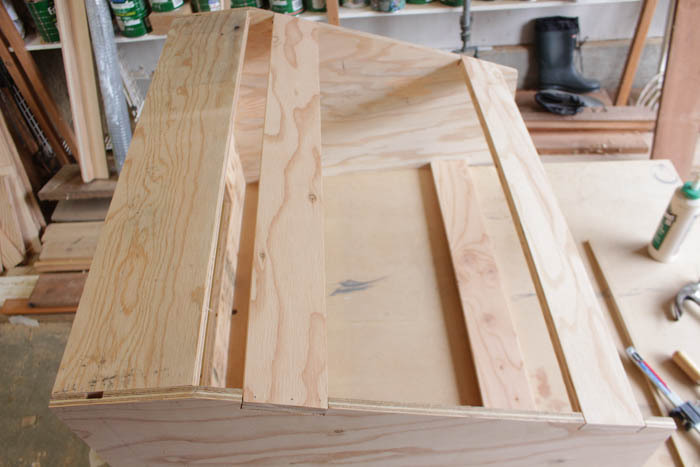 ), so we felt that building the structure of the hood out of wood plywood was a better choice. Thanks for your visit and good luck with your project! Looks great. If you did it again, would you have insulated inside the enclosure for noise proofing? Or is the vent quiet enough as is? That looks amazing. I love the style you designed. It really looks so good. Wow Krista, that’s quite the To Do List but the results sound like they will be fabulous. Kudos to you guys for DIYing a range hood. It looks great and I can’t wait to see what it looks like all finished. I know Marie! The list still sounds so long!! I love the range hood- I’m priming it today and then will do the final paint once the tiles are up. I can’t wait to get the tiling and paneled ceilings finished. The hubs is still dragging his feet on the ceilings. Keeping my fingers crossed:) I can’t wait to see it finished, too!! Looks fantastic! So glad you’re able to check another thing off your list. 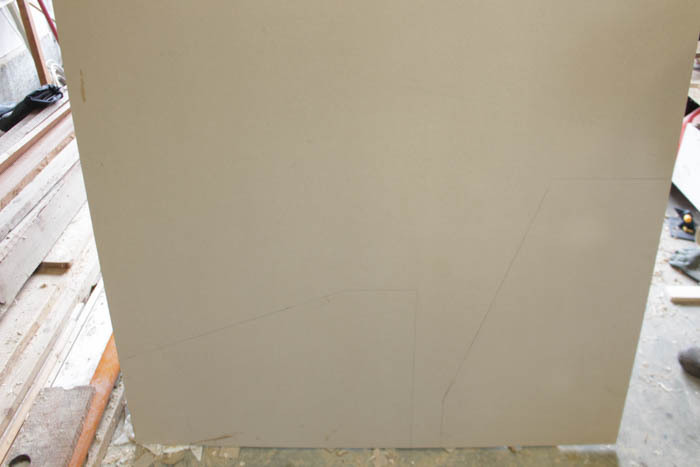 These renos that go on and on… Ugh! Oh my gosh Krista!!! It’s absolutely perfect! I’ve always dreamed of a custom wood range hood just like this! LOOOOOVE it! Thanks Kristi- I can’t wait to get it painted! !